Do you currently offer radon testing? If not, you can increase your business revenue by providing this valuable service for your clients. Radon measurement is not difficult to master, but it does require training and certification. 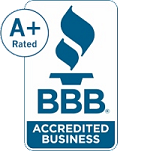 Radon-certified home inspectors typically charge an additional $150 to perform a radon measurement test and provide a radon report to the client, which can add significantly to your bottom line. PHII's online radon certification course will teach you the fundamentals of radon, the hazards of radon exposure to the human body, along with the proper techniques for measuring and reporting concentrations in buildings. You will learn where radon enters buildings and how to use inexpensive equipment to record quality-assured results for your clients. As you complete each lesson, you will use interactive flash cards and take practice quizzes that will test your knowledge, generate instant feedback and provide opportunities to correct mistakes, re-learn information and re-test. Our system keeps track of your progress, so you can take a break at any time, even turn off your computer and the course will return to where you left off. When you finish the course and pass the final exam, you will possess the knowledge and skills needed to conduct radon testing. Includes assistance in coordinating and scheduling the recommended National Radon Safety Board (NRSB) exam or (NRPP) exam. Some of the features include online flashcards and testing, video clips, online access, certificate and toll free support. You will also receive the EPA Citzens Guide to Radon, EPA Homebuyers and Seller's Guide to Radon, EPA Consumer's Guide to Radon Reduction in e-document. Includes Radon Inspection Forms & Mitigation Systems Checklist! 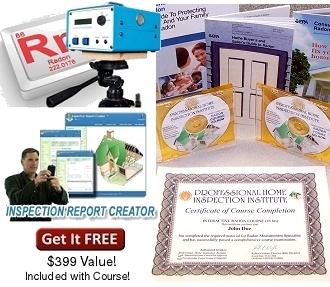 Online Course Access and optional back-up CD, Report Templates, Online Flashcards & Testing, Certificate, Toll Free Student Support, EPA Guides to Radon, Radon Inspection Forms, Mitigation Systems Checklist, and Non-interference Radon Test Agreement.